Our Hand Fans are produced from 16 pt. cover stock which are then glued onto a wooden handle/stick. When you have decided on a sandwich fan there are a variety of shapes to choose from. The size of the shapes range from 7 1/4"x 7 1/4" to 8"x8" to 5 1/2"x9". Available shapes are as follows: Hour Glass fn100s, Square fn104s, Octagon fn108s, Circle fn116s, Oval/Football fn126s, Heart FN128S, Bread Slice fn148s, and a Rectangle fn150s. 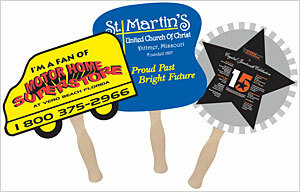 Other shapes are available, see custom shaped hand fans or call customer service for details. Standard production on hand fans is 5 working days. Prices below include one color printed on a white surface and a attacehd wooded handle. The setup/plate charge for additional colors/sides is $50.00(A) RUSH SERVICE IS AVAILABLE.